Pine bark fines are a type of mulch made up of finely shredded pine tree bark. They are commonly used as a soil conditioner for those who want to grow plants such as azaleas, magnolias, and hollies that do well in more acidic soil. They are also great as top dressing mulch for annual flower beds, and their natural reddish brown color complements Spanish architecture and homes located in woodlands. Pine bark fines are almost always made without any kind of dye, and it lasts longer than most other kinds of mulch. It is also ideal for walking paths as it tends to stay in place, and it increases the health of most gardens as it decomposes. Pine bark fines are usually processed to an exact thickness and particle size. The larger particle sizes greatly increase drainage for the soil while it maintains a high moisture retention rate. Even the mulch that comes in smaller particle sizes can be great for a garden if you wish to offset more alkaline elements such as lava rock and pumice. The lighter weight of pine mulch also means that it will be very easy to spread pine bark fines, so they are ideal for those who want to add mulch to a garden easily. 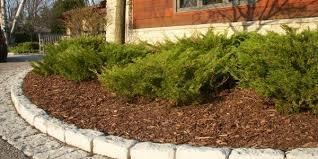 Generally speaking, any kind of mulch will be healthy for a garden or yard, and pine bark mulch is no exception. Not only are pine bark fines ideal for growing plants that might otherwise not thrive in your garden, but it can give your landscape an attractive appearance without the need of artificial colors and dyes. You can purchase pine bark mulch of varying particle size from practically any gardening or landscaping supply company, so shop around to find the best deals for your own landscaping and gardening needs.